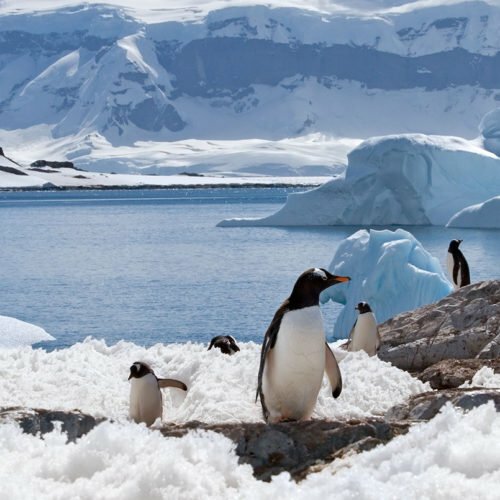 Imagine you’re cruising south towards the Great White Continent, to the Falklands Islands with their gentoo penguins, super-sized seal lions and killer whales, billion-year old rock formations and vivid birdlife ranging from wrens to albatross. Imagine visiting South Georgia, where you’ll discover historic explorer sites and old whaling stations. You’ll encounter great colonies of impressive king penguins, and fur seals in such numbers that you won’t believe your eyes. Three quarters of the world’s population of these charming ‘sea puppies’ breed here - attracting some deadly hunters; killer whales. Imagine being confronted by vast colonies of rock-hopper penguins and black-browed albatrosses. Imagine braving the extremes of temperature, the floating ice fields, the monstrous yet beautiful icebergs. Now imagine that, instead of the comfort of a cruise ship you’re undertaking the 800-mile voyage in a 22 foot boat. That is what Shackleton achieved, before coming to his final resting place at Grytviken. NB: Itineraries may vary in length by a day or two. Some reverse itineraries and Fly-Cruises (flying from Santiago in Chile to the Falklands – to cut sailing time) are available. Embark in the bustling port of Ushuaia, Tierra del Fuego and sail for the Falklands. Explore the famous Falkland islands with their surprisingly rich wildlife. Cross the Scotia Sea, enjoying briefing lectures and spotting kelp-skirted Shag Rocks. Discover South Georgia with its historic sites and whaling stations. Re-cross the Scotia Sea, heading for the South Orkneys and Antarctica. Cruise to the astonishing wilderness and endless photo opportunity that is the Antarctic Peninsula. Return through Drake’s Passage with time to relax and relive your Antarctic experience. Disembark in Ushuaia to catch your homeward flights.